PARIS, France (CNN) -- The Church of Scientology went on trial this week in France, accused of fraud in a case that sheds light on the group. 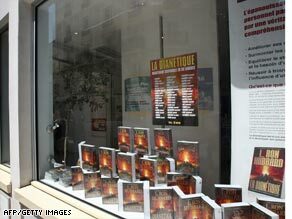 The Church of Scientology's bookshop in Paris is part of the case being heard in France. If found guilty, the church could be forced to shut down in France, though appeals could see the case continue for years. "This is a process in heresy," Daniele Gounord, the spokeswoman for Scientology in France, told reporters. The two plaintiffs, both women, say they were defrauded by the organization, which is classified as a sect in France. Their complaints focus on the use of a device that Scientologists say measures spiritual well-being. Members use the electropsychometer, or E-Meter, to "locate areas of spiritual duress or travail so they can be addressed and handled," according to Scientology's Web site. The women say that, after using the device, they were encouraged to pay for vitamins and books. They say that amounted to fraud. The first plaintiff, Aude-Claire Malton, is a housekeeper at a Paris hotel who says she spent about €21,000 ($29,000) in "sauna therapy" and classes to "heal the mind," according to French media. Her fellow plaintiff is Nelly Reziga, who has told French media that her boss fired her because she refused to attend classes at the Scientology church. Reziga's boss, Max Barbault, was originally a defendant but has died, according to French media. Six Scientology members are now on trial, along with two corporate entities -- the church and the bookshop it runs in Paris. If found guilty, the Scientology members would face a maximum of 10 years in prison and fines of as much as €10 million ($13.9 million) each. The church and the bookshop could be liable for as much as €5 million ($6.95 million) in fines and could be forced to shut down if found guilty. The trial began Monday and is scheduled to last until June 17. The defendants are expected to appeal if found guilty. CNN's Jim Bittermann contributed to this report.